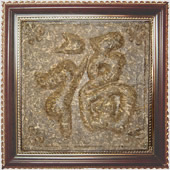 Picturized Chinese characters usually have one or more meanings and some of them are particularly interested by our current tea aficionados, who compress Pu-erh tea leaves into a square brick with a lucky Chinese word on it. All those teas are fermented slightly before they are pressed into these solid slabs. 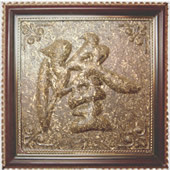 In the most of West countries, those tea bricks are mainly decorative items for the tea lovers who have everything – despite the fact that the tea is quite delicious, too. 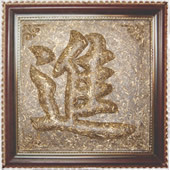 'Fu' is one of the most popular Chinese characters used in Chinese New Year. 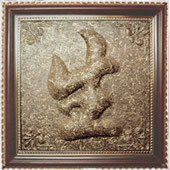 It is often posted upside down on the front door of a house or an apartment. The upside down 'Fu' means 'good luck' came since the character for upside down in Chinese sounds the same as the character for came. Size: 15 inches length, 15 inches width and 1.5 inches thickness. 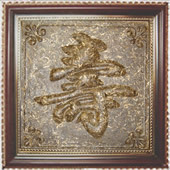 (Purchase for a set of "Fu, Lu, Shou & Xi", discounted price is @$169.99 for 4 pieces and the balance will be refunded). It used to mean official's salary in feudal China. But now 'Lu' refers to working people's wages, salary or other incomes. 'Shou' also means life, age or birthday. It is always posted on birthday parties. Double happiness is usually posted everywhere on Chinese weddings. 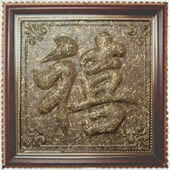 'Xi' expresses common people's pursuing of "good fortune","wealth","long living" and "happiness". 'Sheng' always goes with the following 3 words: 'Yi', 'Xing' and 'Long', Those four characters together mean "Good luck with your business". (Purchase for a set of "Sheng, Yi, Xing & Long", discounted price is @$169.99 for 4 pieces and the balance will be refunded). 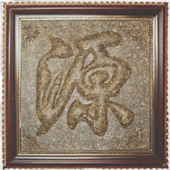 A character of 'Yi' is one of the set of those four characters in Chinese: 'Sheng', 'Yi', 'Xing' and 'Long', which means "Good Luck with your business". Often, the set is posted for the grand opening of a business. 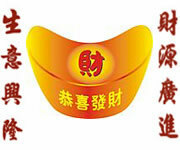 'Xing' is a very common Chinese word by using many occasions, such as New Year, Grand Opening, new home and so on. 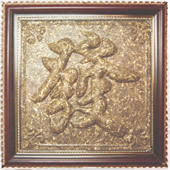 It is one of elements of a set of 'Sheng', Yi', 'Xing' and 'Long', which means "Good Luck with your business". This word must show at all grand opening occasions. 'Long' is one of the set elements of 'Sheng', 'Yi', 'Xing' and 'Long'. Chinese often say money can make a ghost turn a millstone. It is to say money really can do a lot of things. 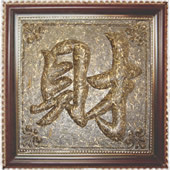 'Cai' is one of the elements of 'Cai', 'Yuan', 'Guang' and 'Jin', which can be translated into "Rolling your money or wealth widely into your door". 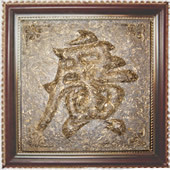 (Purchase for a set of "Cai, Yuan, Guang & Jin", discounted price is @$169.99 for 4 pieces and the balance will be refunded). 'Yuan' in Chinese is a place or thing from which something comes or derives. Normally it refers to money or wealth. 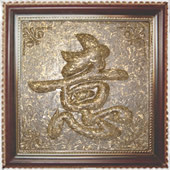 It goes with other three Chinese words of 'Cai, 'Guang' and 'Jin', which means "Rolling your money or wealth widely into your door". It is one of the four words ('Cai', 'Yuan', 'Guang' and 'Jin') in Chinese using frequently for business openings and New Year. The phase means "Rolling your money or wealth widely into your door". 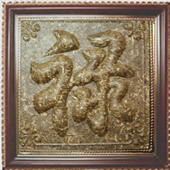 It consists with other three Chinese characters, 'Cai', 'Yuan' and 'Guang' of making a common phase for all the business openings, which means "Rolling your money or wealth widely into your door". These are many ways to be interpreted this famous Chinese phase into English, such as "Congratulations on getting rich (traditional Chinese New Year's future use)", or "May you be prosperous", or "Wish you all the best" and so on. 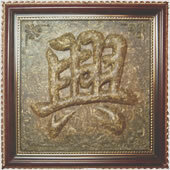 'Gong' is the first Chinese word of the phase. 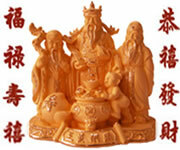 (Purchase for a set of "Gong, Xi, Fa & Cai", discounted price is @$169.99 for 4 pieces and the balance will be refunded). 'Fa' is another most common Chinese lucky word next to 'Fu'. 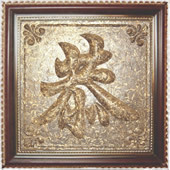 Just as the Chinese character 'Fu', It can be posted upside down on a wall or on the front of door. The upside down 'Fa' means 'good money' came to your way since the character for upside down in Chinese sounds the same as the character for came.